One of the best solutions dentists have at their disposal are dental crowns, which are designed to replace damaged or missing teeth. People may be are facing a successful treatment even though the tooth is in a state of structural disarray. This intervention not only protects the integrity of tooth but the patient gets his or her oral functionality back. Given the importance of this treatment, there is no wonder why many users want to know more about cosmetic dental services. Placing a dental crown is a process consisting of a series of steps performed in the dental clinic and the first of these is to make a mold of the tooth that will help dentists prepare a temporary crown. Once the necessary measures have been taken, the dentist will start shaping the tooth so the crown can fit perfectly. 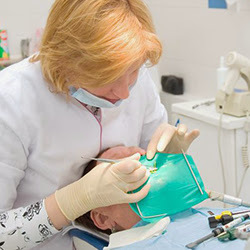 This part of the procedure also allows the professional to ensure the patient’s dental health is at its peak. He or she will then proceed to place the temporary crown, which is designed for aesthetic reasons as well as to protect the tooth from bacteria while the mold is sent to the dental laboratory. Normally, temporary crowns do not last too long. However, in some cases they may remain in place for more than a year. If circumstances require, the dentist will ensure that the crown has a perfect hold and can perform their duties properly until a later date. Once the mold comes back, the dentist will cement and adjust the new crown with respect to its contact occlusion and those teeth around it. Visit Billingsadvanceddental.com to learn more.